On Monday, drivers for companies like Uber and Lyft along with City Commissioner Nick Fish, union members, and community allies gathered outside of Portland City Hall to demand a voice in how app-based transportation companies (also called transportation network companies) operate with the city. The rally is part of our Transportation Fairness campaign. Learn more and send a letter to Portland City Council by clicking here. Take Action: Tell Portland City Council it’s time for drives and the community to have a voice in how companies like Uber operate. Volunteers of America Oregon has spent thousands of dollars meant for client care on union busting attorneys. VOA Board Members need to step up and do their job to help settle a contract. Sign the petition today! Support ATU Local 757 Special Education School Bus Drivers at the PPS Board! Please join PPS drivers and our allies at next Portland Public School Board meeting to demand that PPS sign a FAIR CONTRACT NOW! The rally will be held at the PPS Offices at 501 N. Dixon Street in Portland on Tuesday, May 8 at 6pm. Click here for more information. Join us on May 12 to get out the vote for Val Hoyle for Labor Commissioner! Click here for all the details. If you need more information about your ballot or how to vote, make sure to visit www.oregonvotes.gov. Last week we proudly announced the launch of The Voice of Oregon’s Workers – a new podcast from the Oregon AFL-CIO. Click here to listen to our inaugural episode featuring insights and history of May Day. You are now able to find our podcast on iTunes and Stitcher. Stay tuned for our next episode later this month. 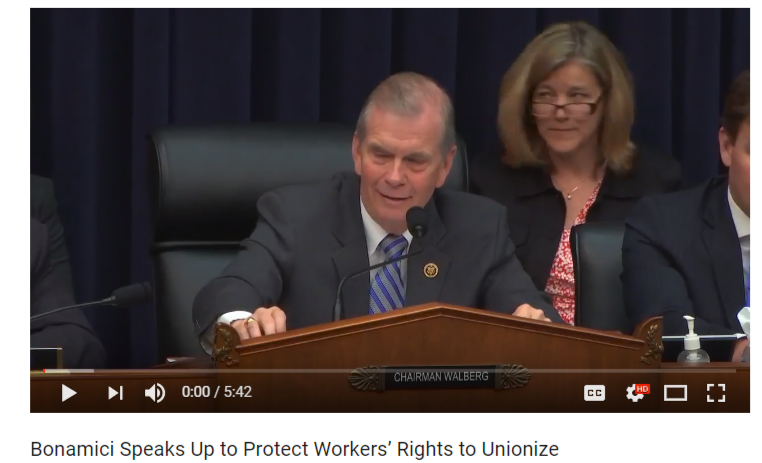 Last week, the Congressional Subcommittee on Health, Employment, Labor and Pensions held a hearing entitled, “Worker-Management Relations: Examining the Need to Modernize Federal Labor Law.” Unfortunately for workers, anti-worker members of Congress called the hearing to propose crippling people’s rights to stand together and advocate for better wages and working conditions. Oregon’s own Congresswoman Suzanne Bonamici spoke up on behalf of our right to organize. Click here to watch the video. Thank you, Congresswoman Bonamici! On Friday, April 27, the Oregon AFL-CIO and Oregon OSHA hosted the annual observation of Workers Memorial Day. Joined by representatives from Governor Kate Brown’s office and by State Representative Teresa Alonso Leon, the ceremony honored each worker and member of the armed services who died on the job in 2017. Click here to see a video of this year’s service. For the 26th year in a row, the National Association of Letter Carriers (NALC) will be conducting its "Stamp Out Hunger" Food Drive. This year's partners for the food drive include: the AFL-CIO, the United Food and Commercial Workers (UFCW), the National Rural Letter Carriers’ Association, the U.S. Postal Service, United Way Worldwide, Valpak and Valassis. Every year on the second Saturday in May, postal carriers, in addition to their regular workload, collect food from people in more than 10,000 cities across the country. Each year, it is the largest one-day food drive in the world. Click here to learn more. Newer PostIt's Time to Vote!